Collaborate through workshops, installations, recordings and discussions to explore how making, reviewing and remaking is an important part of society and politics. Join the debate with staff, students, artists and local community partners. Discuss big ideas in society including gender, identity, cooperation, consumerism, war, and faith. 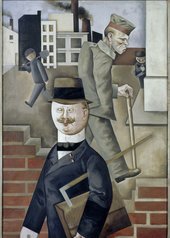 12.00-15.00 World War I: Production, Destruction and the Avant-Garde: Join school groups and students to explore the debates surrounding production and destruction in art and society in Europe in the period around the First World War. From futurism’s apparently upbeat ideas of war to Dada’s reaction to its horrors, explore tensions between celebration and critique, making and breaking. 15.00-18.00 Images and Words: Explore imaginative ways of producing, curating and talking about images. Focusing on the relationship between photography and audio-description, this interactive workshop will involve collaborating with other participants in reviewing the way we think about and present images and / in the exhibition space. Engage with the Tate Modern collection and experiment with different ways of exhibiting your own original work produced on the day. 12.00-21.00 Making Sacred Space: Join us for a day and evening of workshops, installations and screenings exploring the creativity of everyday religion. Focusing on architectures, material cultures, rituals, music, and performance, this day will involve collaborative co-production with artists, cultural geographers and local faith groups from Ealing, West London. Drop into creative workshops and activities running in parallel throughout the day. Join an architecture workshop designing a new religious building, contribute to embroidery in our Fabric of faith installation, learn traditional Hindu flower garland making, design a kite for our kite festival, add a contribution to a book of recipes that evoke spiritual memories or learn to rap, sing and chant in our sacred music performance workshops. Participating artists and organisations: Making Suburban Faith, Royal Holloway Centre for GeoHumanities, MYAA, Laura Cuch, Liz Hingley, Katy Beinart, Nazneen Ahmed, Natalie Hyacinth, Mr K, St Thomas Anglican Church. Respond – 19 May 2018: Small Actions with Big Ideas! 12.00-18.00 Reproducing Joan: Inspired by the work of Joan Jonas and the Tate's retrospective exhibition (March-August 2018), this day's events will enter into a material dialogue with Jonas' work through workshops, talks, and performances. Join us to interact with projections and experiment with signature Jonas props. Come along to a panel discussion amongst Drama and Theatre Studies scholars about the relationship between performance and museums and share your thoughts, questions, and feedback. Participate in a series of short Jonas-inspired music, Noh theatre, dance, and drawing activities. Throughout the day, you are invited to play an active role in questioning fixed views and interpretations, as well as expressing your own. Stages of Production: Review / Remake / Respond is led by staff, associated artists and students from across Royal Holloway University’s departments of Drama, Theatre & Dance, Geography, Modern Languages and Media Arts. This event is programmed by Royal Holloway, University of London, a Tate Exchange Associate. Royal Holloway, University of London was founded by two social reformers who pioneered the ideal of education and knowledge for all. Royal Holloway has an emphasis on creative subjects, with outstanding teaching and research in Drama, Theatre & Dance, Media Arts, Music, Modern Languages and Geography. We welcome students and academics from all over the world, ensuring an international and multi-cultural perspective within a close-knit community and historic campus just outside of London.